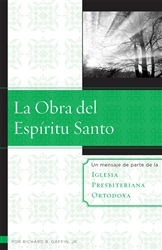 La Obra del Espíritu Sancto by Richard B. Gaffin Jr. This is the Spanish translation of The Work of the Holy Spirit. The cost is $1.25 for up to 9 copies, and only $1 each for 10+ copies. Copyright © Orthodox Presbyterian Church.